The tips below cover some of the most common lockbox issues. Please read these carefully, and if you are still having trouble call us. Make sure you’ve carefully checked the lockbox location in the app or website. If you still can’t find the lockbox, give the owner a call (you'll find their contact details in the app) or call us. Our member support line is available to help 24/7. To wake the lockbox, hold [ENT]. The keypad will light up and beep. You can now enter the lockbox code. If you are in a loud or busy area you may not hear the beep, so listen carefully and look for the keypad lighting up. If the lockbox is still unresponsive, it may need to be reset. Try inserting any credit card sized card into the slot at the bottom of the lockbox. This will wake the device and you can enter the code following the steps above. If you’re still having trouble, call us. We’re available to help 24/7. You won't be able to generate a code if you are more than two hours late in returning the car - you will need to call us to get the code. Take a deep breath and make sure you’re following these steps for opening the lockbox exactly. You should hear a beep for each button you press. Enter the code slowly and make sure you hear a beep for each number. Press [ENT]. You should see the ‘Ready’ light flash green and hear a whirring sound as the lockbox unlatches. If it’s the end of your trip, make sure you’ve generated a new code. Double check the rego of the car against the rego displayed in your trip instructions in the app. If you're in an area where there are several Car Next Door cars, you may have accidentally gone to the wrong car. 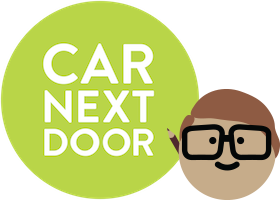 If the rego doesn't match, double check the address of the car in the app and take another look around - the right car could be just down the street! If the code still won’t work, call us. We’re available to help 24/7. If you enter the code incorrectly 4 times, you’ll need to wait one minute before you can try again. If this doesn’t work, call us. We’re available to help 24/7. The lockbox latch may have become stuck. Try entering the code again, but rather than opening the lockbox hold it closed tightly to allow the latch to click properly into position. Try entering the code and opening the lockbox again. The key might be getting in the way. Take the key out and see if the lockbox will close without it. If it does, re-enter the code (it will last for 4 hours), open the lockbox again and fit the key in a such a way that the lockbox will shut. Something might be caught to prevent the lockbox from closing. Check that the rain jacket or other items aren’t preventing the lockbox from closing properly. You might not be pushing hard enough. Firmly press the lockbox closed - you might need to apply some gentle force. If these steps don’t work, call us. We’re available to help 24/7. The lockbox may have been left open for too long causing the latch to fully engage. Enter the lockbox code to unlock the latch, then try closing the lockbox again.